Keeping with the Need to Sew theme, my daughter NEEDED a swimsuit. We shopped RTW first, even dragging little brother along to add to everyone's torture. After trying dozens of suits, we found nothing that gave her decent coverage in the chest. Swimsuit shopping can be so brutal! During a good cry in the Dillard's dressing room, I assured her that I could make her something to FIT. So we headed across the parking lot to Hancock Fabrics. Within a few minutes, girlfriend was smiling again, having found a super cute navy/white polka dot spandex that she paired with a cheery red. "Sure, I can sew a suit that fits you!" Although I never have sewn one before, I remembered an email Burda Style sent me advertising their Alison swimsuit (formerly free) for $3.99 with a free webinar. 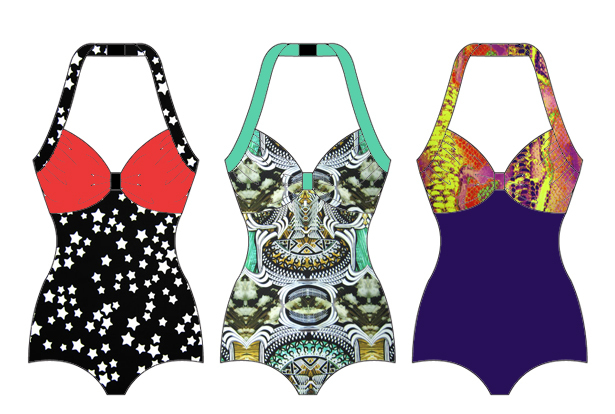 I've never taken a Burda Style webinar, but I do love Craftsy, so it sounded like a great way to make a first swimsuit. Never mind that Stephanie wanted a two piece, I really wanted to make this one! Additional length in the torso would have better aligned the bust. The instructions that come with the pattern are minimal and steps are a bit out of order (IMO). I have read that the initial free pattern had no instructions, so this is an improvement. There are no notches. Most of the pieces are fairly easy to figure out, but not all. For anyone who has made a swimsuit before, it's likely not a problem. I created a few match points for myself, which did help keep things straight. If you're pattern matching, take care to walk the pattern pieces and mark notches. Many of the pattern pieces should be cut on the fold, but it is not stated as such. I caught one mistake (crotch piece), but missed the back strap, which would have been way too short to tie a bow (pic below) anyway. My version has a hook that connects two shorter straps, instead. One pattern piece is not labeled, but it was easy to figure out it was the front tab. No marks or suggestions for gathering the bust insert. I followed the directions of the webinar, but looking at the final product, I should have gathered more fabric. I missed the instruction to add 3/8" SA to the legs for elastic. Since 5/8" SA were already included, I'm not sure why this wasn't already done. My daughter is fine with the higher leg, but if you want a more retro leg, add 3/8". Although it is a print-at-home PDF, there are less than 10 pieces of paper to paste together and tracing was quick, because the pattern pieces are not complex. It's a flattering final product. I'd definitely make it again, even if I cursed it several times during the first version. There is very little elastic used, only around the legs. All other edges use fabric banding. In my opinion, this is a more comfortable option. I think I may have over-elasticated the back a tiny bit. My back strap was only about 5" long and definitely too short for a bow. As for the "webinar", it was more of a narrated film strip, nothing like a Craftsy class. I can't complain too much, since I paid only $3.99 for pattern and class, and it did give pretty good instructions to help me figure out how to put the suit together correctly. Given that we regard this first version of our swimsuit a wearable muslin, it came out pretty darn cute. I need to add length to the torso, and it could still use more fabric at the bust. My "FBA" was nothing more than forcing the size L bust insert into the size M front/back. We really needed an XL or an XXL (not included, so I will need to draft it). That's why toiles were invented, non? This is a very flattering swimsuit style, and the process made me realize that swimsuit construction is not that scary. I used my serger for part of the construction, and my Bernina 930 to baste some seams and apply the leg elastic. The bathing suit looks really well made and pretty on your daughter. I was asked to do a webinar by Burda and I haven't bitten the bullet yet because I so love Craftsy classes and can't imagine being able to come up to those standards in a Webinar format so I was interested in your reaction to the one you watched. Have you considered joining Bloglovin? It sends out an update every morning of new posts by it's members so evryone can keep up with everybody else's projects. Thank you for following me on Diana's Sewing Lessons. I'd like to return the favour and follow you too. Just a thought! How funny, I think I was reading your latest post on Diana's Sewing Lessons, at the same time you left me this message! Thank you for the suggestion. It's something that I've been "meaning to do", so I'm going to join Bloglovin RIGHT NOW. Thanks for reading! Thanks! The dots are definitely fun.